The short description above provides nowhere near enough information to merit the use of an equivocation hitch. That is certainly a technique that if done wrong, could result in injury or fatality. I bring it up here, merely as a note to those out there that already use the equivocation hitch to help them understand the Lobster Tail. In addition to the Daisy Chain and the Lobster Tail, there is a third technique that you may use. 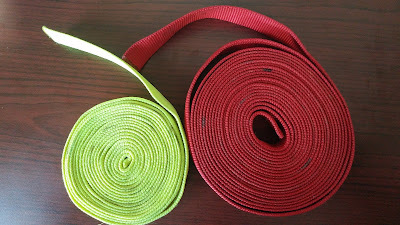 It is also possible to simply roll the webbing up into a spool. There are a lot of ways to stow webbing. The best thing for you to do on your rescue team is to experiment with each of the styles. On climbing trips and courses, it is not the grand gestures that dictate success, but a series of small, diligent habits. These form by consistently making choices to take care of yourself. In the backcountry, some of these choices and habits can be different for women than for men due to key differences in physiology. Here’s a quick overview of some issues women can face in the mountains, and some simple tips and tricks to help you have a fun, safe and successful course. Women often feel colder than men in the mountains, especially in the hands and feet. There are several ways to deal with this difference. The first is to regulate your overall body temperature by keeping your core warm. When your core is warm, your extremities will also be warmer. For women, making this happen can mean wearing a few more layers on your core than guys—perhaps carrying an extra lightweight puffy jacket or another thin, insulating layer like an R1. Move in lighter layers – you should be a bit chilly when you start out after a break – but keep a warm layer available in the top of your pack for when you stop. For gloves, you’ll want to strike a balance between keeping your hands warm and making sure you have the dexterity required to hold an ice axe or clip carabiners. Make SURE you have a warm pair of gloves that you can comfortably handle carabiners with – a common cause of frostnip/bite is to take off gloves to mess with hardware. Many women have smaller body sizes and do not have the same upper body strength as men. This does not mean they are unable to do certain things – they just need to figure out different ways to accomplish the same tasks without injury. When carrying a heavy pack, make sure you understand proper lifting techniques. Grab the pack by the straps, lift it onto your knee, and then swing it onto your back. If you are using a new pack and you haven't carried a heavy load in it, put weight in it and go on a hike. Do all the adjustments you can to the waist belt, shoulder straps, etc. Adjust your straps so the majority of your load is on your hips and lower back and not your shoulders. Your hip belt should sit just on or above your hip bones. There are numerous packs on the market designed specifically for women, but ultimately choose the one that feels the most comfortable with your body type. The climbing industry is catching onto the fact that women are climbing high, cold mountains, but many of the boot choices for these environments are still only offered in men’s sizes. Women’s heels can be skinnier than men’s, so if you’re a woman wearing men’s boots proper bootfitting is essential. If you can get to snow, go hiking/snowshoeing in your expedition boots, preferably with your pack. Then you will have time to get new footbeds or adjust your sock system before the trip. Small adjustments like this can make the difference between comfort and misery over the course of a trip. Women’s sleeping bags are a good idea, as they tend to be shaped for women’s bodies and include more insulation in the footbed. The only downsides are that they are built specifically for women of short or average height (5’6’’ or smaller) so tall women need to either get a women’s long or a men’s bag. If you have to go with a men’s bag consider budgeting an extra 10 degrees (so if you need a bag that keeps you warm at 0, get a men’s -10 degree, etc.). Pee funnels like the GoGirl or the Freshette provide a way for a woman to urinate while standing up. These are essentially funnels that you may press against yourself when you urinate. There isn’t a tremendous amount of privacy on our mountaineering trips in the Cascades and elsewhere. On most days you will spend the majority of your time tied into a rope with your teammates. A pee funnel allows you a small modicum of privacy when you urinate. Some female guides use these extensively whereas others prefer to simply have the team turn away while they squat to urinate. Ultimately the choice as to whether to use one of these devices is up to you. If you choose to use a pee funnel it is recommended that you practice with it prior to the start of the expedition. In order to keep it from overflowing you will have to manage the rate at which you urinate. Bring 1-2 pairs of synthetic or wool underpants and one pair of cotton underwear or boxers to sleep in. The cotton underwear can also help you feel cleaner if you have your period during the trip. Bring a separate bottle to pee in at night (or in a storm) so you don’t have to get out of your tent. Collapsible Nalgene 1.5-2 L bottles work the best. Some women tell their tentmates 'I'm closing the bathroom door' or something similar so they know not to look. You can use the pee bottle with or without a pee funnel. Practice this at home in the shower so you know you’ll feel comfortable doing it in a tent later on. Women are more prone to urinary tract and yeast infections if they don’t wipe regularly, so it’s a good idea to bring extra toilet paper or a bandana to wipe after peeing (even if you use a funnel). If you use a bandana (aka “pee rag”) you can tie it to your pack to dry out afterward as you continue to hike. Any used toilet paper should be placed in a Ziploc bag and packed out. And now for the big question for women on expeditions – how do I deal with that time of the month? 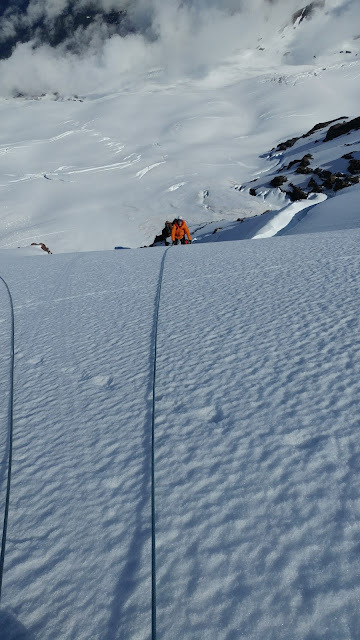 Answer: it’s not that bad – read on for one Denali guide’s (quite specific) guide to dealing with it! For my period, I use a Diva Cup (the Keeper is another brand). I also use it in the rest of life when not on expeditions. I can carry one with me wherever I camp/hike/climb without worrying about running out of tampons, and if I don't have any tissues I can clean it with water from my water bottle or with snow. I don't use snow on the glacier because we use camps other parties use and I don't want to leave bloody snow for people to see. I take some toilet tissues and pour the blood from the cup into these. I clean the Diva Cup with more tissues. I wrap the bloody tissues in some more tissues and put it in the CMC (Clean Mountain Can, used on Denali) or other latrine. If I feel shy about putting this in a communal latrine I put the tissues in either a brown paper bag or an opaque plastic bag (this is better; it doesn't soak through) that I then carry with me. I clean myself with wet wipes, and sanitize my hands. Wet wipes freeze, but you can keep a travel packet inside your parka for bathroom time. If you want to use tampons, the method is very similar. Take the tampon out, wrap it up with tissue, put it in the opaque bag. If the idea of using one bag for the whole trip is gross, you can bring a few bags set up this way. And obviously, if you choose to use tampons, it’s important to make sure that you have enough with you. You should pack out any used tampons in a Ziploc bag, and you can wrap the bag with duct tape ahead of time to conceal the contents for privacy. If you get menstrual cramps, bring whatever painkillers you usually use to help ease them. The single most important muscle that a climber of any gender will use is between the ears. A positive attitude, good self-care, and the willingness to face and work with the realities you are presented by your body and environment are the best predictors of success. You will have good days and bad days. You and your teammates will take turns being the stronger or weaker members of the expedition, but it is your bond as a group that will get you up and back. We strive to provide all our climbers with the best information and recommendations for our programs around the world. If you have any questions regarding the information in this document or would like to speak with a female AAI guide, please feel free to contact the AAI office. 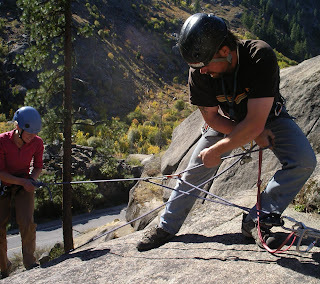 Belaying is the baseline for everything that we do at the crags and in the mountains. The American Alpine Club, the Climbing Wall Association and the American Mountain Guides Association have been working hard over the last few years to try to develop a universal standard for belays in the United States. Recently, the American Alpine Club produced a video that shows several belay variations. They demonstrate two versions of the PBUS (Pull. Brake. Under. Slide), one version of the two handed technique (a terrible and uncomfortable technique) and the shuffle technique (something that beginners should never do). The brake-hand should never leave the rope. Hands should only slide when the rope is in the braking position. Hands should be in a position of strength. The video goes quickly through the belay commands. Unfortunately, the commands shown do use the word "take," which is a single syllable word and can be confused with slack, rock, or safe. At AAI, we prefer the term, "tension." The video demonstrates a quick safety check, allows the two models to perform some of the worst line readings of "on belay" and "belay on" in history, and then launches into the belay technique for toprope climbers. I am definitely not a fan of the shuffle technique. It is an acceptable technique, but I don't think it's appropriate for people learning to belay. If you are someone who has the opportunity to teach belaying, I would cut this from any training for beginners. It's good to see that the AAC is putting these videos together. There are far too many people out there still using archaic belay techniques...and as a result, there are still too many accidents from inadequate belays. At the American Alpine Institute, we teach two kinds of rescue programs. The first are self-rescue programs. These are programs and lessons that will allow a technical climber to perform a rescue of himself or his partner with the tools he is carrying. The second kind are team rescue programs. These are program where a team of rescue volunteers or professionals work together with specialized gear to perform a rescue. We also call this "rope rescue." In self-rescue the most common releasable hitch is the munter-mule. In rope rescue - a place where the loads are much greater - the most common load releasable hitch is the radium release. Like most hitches, there are several ways to tie them. The radium release is no different. But the following video provides you with a basic understanding of how to tie this hitch. Passive protection is protection with no moving parts. The most common type of passive pro -- and the cheapest -- are wires (often referred to as nuts). These most popular wires are Wild Country Rocks and Black Diamond Stoppers. Those new to traditional climbing often start their careers working with wires. On easier rock climbs where there are a lot of stances, it's reasonable to take your time and place these well. In the following video Jullie Ellison from Climbing magazine discusses how to place wires. Running - Rock Quality - Is the rock good? What kind of rock is it? Will it break? 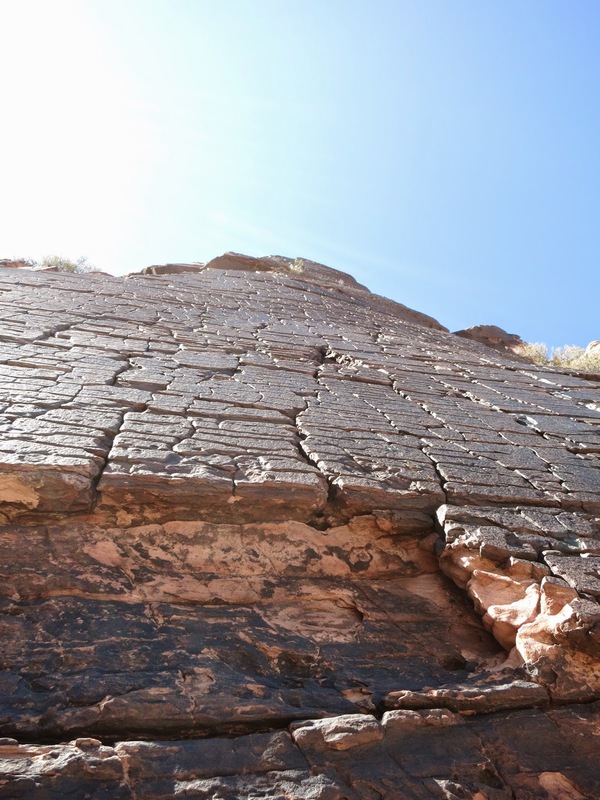 Are you placing your protection in a crack in the rock or a crack in the earth? If it's a crack in the rock, is it acceptable? Dogs - Direction of Pull - Is the direction of pull appropriate for the piece. If the climber falls is the piece oriented appropriately to catch it? If the piece is part of an anchor, is the piece oriented properly for that? As a sidenote, it's not uncommon for a draw to pull a wire out of its placement. It's often better to use a sling or an alpine draw on this type of protection. Chase - Constriction - Is there a good constriction for the piece? Have you put it in the perfect spot to ensure that when it's pulled on, it will be pulled into a tighter position? Squirrels - Surface Contact - Does each side of the wire have good contact? Or is it only marginally in the crack? Julie also mentioned ways to clean a wire. She started with pulling upward on it, and then jumped to using a nut tool. There is a mid-level technique as well. If you place your fingers right below the head of the wire and push up on it, this will often allow you to clean it. If you elect to use a nut tool, it's always a good idea to keep the draw clipped to the rope and then clip the nut tool to the piece. This way, when the piece pops out, you won't lose your piece or your nut tool. --Several organizations are working together to collect data on sexual harassment and assault in the climbing community. Participation in a survey on this will help our outdoor organizations understand how big the problem is in order to better address it. To read more and to take the survey, click here. A climber on the Powerline Wall at Mt. Erie. --The Annual Dallas Kloke Work Party will take place on April 21st at 9am at Mt. Erie. Participants should meet at 9am at the base of Ray Auld Drive (the bottom of the Mt. Erie Road) at 8:45 to get assignments. Parties will work together to clean up Mt. Erie and do trail work. This is a great volunteer opportunity. --A skier was killed at Alpine Meadows last week after he lost control. To read more, click here. --The New Yorker has a nice piece on Jeremy Jones -- of Jones Snowboards -- and about the organization he started, Protect Our Winters. To read the piece, click here. --The Access Fund Conservation Team helped build a trail to Scarface in Indian Creek recently. To read more, and see some photos, click here. --The Aspen Times is reporting that there was chaos on closing day at Copper Mountain. A skier tried to jump over the crowd during the event...and missed. Several people were injured. To read more, click here. There's also video of the crash. --The Aspen Times is reporting that, "Snowmass Village police arrested three men on (last) Sunday for skiing in an area that was closed because of avalanche danger just an hour and a half before a Mountain Rescue Aspen volunteer died in an avalanche in Maroon Bowl, police said Thursday." To read more, click here. --The Outdoor Retailer Show Winter Market and Snow Sports Show dates are shifting around for 2019. To read more, click here. --It looks like there are going to be some campground closures this year in the White River National Forest. To read more, click here. --KHQ Q6 is reporting that, "a 39-year-old Bozeman man has died after being caught in an avalanche while skiing in southwest Montana." To read more, click here. --Thankfully the plan to raise national park fees to $70 per car is now unlikely to happen. However, park fees will go up in at least 117 parks this summer. To read more, click here. --USA Today is reporting that, "one of the USA's tallest glaciers is melting at the fastest pace in 400 years, a new study reports. The study said melting on Mount Hunter in Alaska’s Denali National Park can be linked mainly to rising summer temperatures in the region." To read more, click here. --A snowboarder triggered an avalanche last week which closed Teton Pass for several hours. To read more, click here. --The Outdoor Industry Association has broken down how much money is spent on Outdoor Recreation per Congressional district. To read more, click here. A lot of climbers get really wrapped up in using a GriGri on the ground, either for top-roping or for belaying a leader. But a GriGri can also be used effectively at the top of a crag, for belaying a second. One very nice aspect to using a GriGri as your top-of-the-crag belay device, is that it can easily be converted to a hauling system. If your partner can't follow the pitch, you can help him through the difficulties, by quickly switching the GriGri from belay mode to hauling mode. with a GriGri as a ratchet. To start, belay directly off the anchor with your GriGri. Make sure that it is loaded properly so that the climber strand is going to the climber. It is also good to make sure that the handle to the GriGri is facing away from the rock. As you belay, make sure not to take your brake-hand off the brake-strand. When the person gets stuck, tie a catastrophe knot on the brake-strand. This could be an overhand or a figure-eight on a bight. Take a short loop of cord and tie a friction-hitch to the load strand. This can be a prussik-hitch, a kliemheist, or an autoblock hitch. Clip a carabiner to the loop and then clip the brake-strand to the carabiner. Take the catastrophe knot out. Yell down to the climber to climb, in order to help you. Then haul on the haul strand. This is essentially a z-pulley system and so there is a mechanical advantage of 3:1. In other words, you're pulling a third of the person's weight, plus friction. This isn't really enough mechanical advantage to haul a person a significant distance, but it is more than enough to help a person pull a move or two. We should note that a Trango Cinch will work exactly the same way, as will autoblocking devices like the Reverso and the Guide XP. The GriGri is often overlooked as a tool by people who spend a lot of time on multi-pitch terrain or in the mountains, but it is an excellent device for single-pitch climbing. This application of it's use is only one of the many tricks that this device and others like it are able to perform. Jerry Moffatt is a world class climber. In this video, he talks about the mental preparation that he goes through in order to climb a route. To illustrate the process he uses a boulder problem as an example, but this type of thinking could easily be applied to a sport route or even a multi-pitch traditional line. --A climber hiking at Smith Rock fell off of an approach trail and was killed. There is limited information about this incident at this time. To read more, click here. --Busses are going to start running from Seattle to Mt. Si. To read more, click here. --Speaking of Mt. Si, it appears that there have been some vandals in the parking lot there. To read more, click here. --The News Tribune is reporting that, "Washington state's three national parks are planning upgrades thanks to a $1 million donation from the estate of a woman who loved the outdoors, according to Washington's National Park Fund." To read more, click here. --It is possible that the reintroduction of grizzlies to the North Cascades National Park could happen. This movement appeared to have died approximately a year ago, but the idea has been rekindled. To read more, click here. --Actor Jared Leto went on television to talk about a close call with a core shot in Red Rock Canyon. To see the clip, click here. 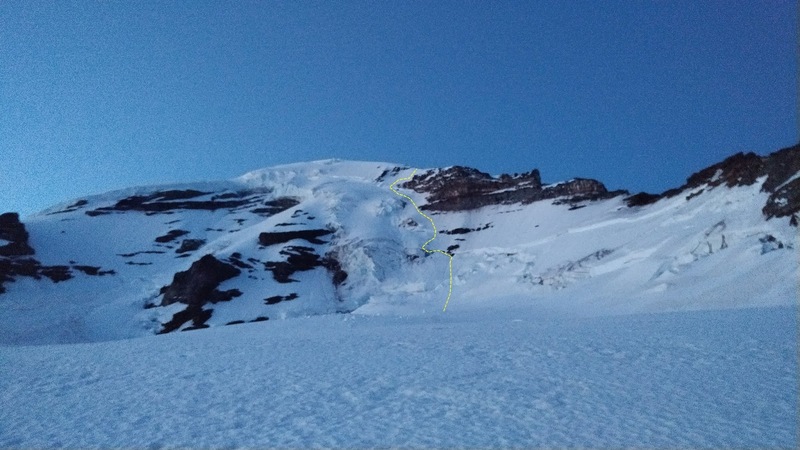 --There have been two avalanche fatalities over the last week in Colorado, one was a skier and the other was a snowmobiler. To read more, click here. --A boulder struck two female climbers in the Florida River Canyon near Durango on Saturday. Both women are in stable condition. To read more, click here. --The Deluth News Tribune is reporting that, "A 20-year-old man died Sunday as a result of injuries suffered in a snowboarding accident at Spirit Mountain Recreation Area in Duluth." To read more, click here. --REI is planning a major shift. Every brand they carry will have to meet sustainable standards -- environmental, health and worker -- by 2020. Read more, here. --USA Today is reporting that, "a 7-year-old Texas girl made history last month when she became the youngest girl to ever climb Mount Kilimanjaro, according to a guide website that tracks Kilimanjaro records." To read more, click here. --Climbing has gone mainstream and climbers are backed by studies that show how much economic clout they have. To read more, click here. --A New York skier claims he was left on a ski lift overnight at Gore Mountain Ski Area. To read more, click here. --SGB Media is reporting that, "REI, celebrating its 80th year, reported sales of $2.62 billion in 2017, a gain of 2.3 percent from $2.56 billion in 2016. The co-op also welcomed nearly 1 million new members and reinvested nearly 70 percent of profits into outdoor communities in 2017." To read more, click here. Armatron is a super fun and unique route on the Brownstone wall at Red Rocks. In an area that is known for immaculate sandstone and outrageous rock formations, Armatron is definitely one of the finest examples of the iron-hard stone the canyon is known for. Armatron can either be approached by a 1 hr hike (long by Red Rocks standards) or you can climb one of the awesome routes on the lower apron of the Brownstone wall, known as Jackrabbit Buttress. Most people do Myster Z, a classic 5.6 that ascends the Jackrabbit buttress and drops you off right at the base of Armatron, but fellow AAI guides and Red Rocks locals Andrew Yasso and Doug Foust recently put up a route on Jackrabbit buttress called Saddle Up, which comes highly recommended! However you decide to approach the Brownstone Wall, Armatron is easily recognizable as a 400 foot wall of black desert varnish with a "tortoise-shell" pattern. The first pitch is the crux of the four pitches, but is very well protected by several shiny new bolts and good small cam placements. 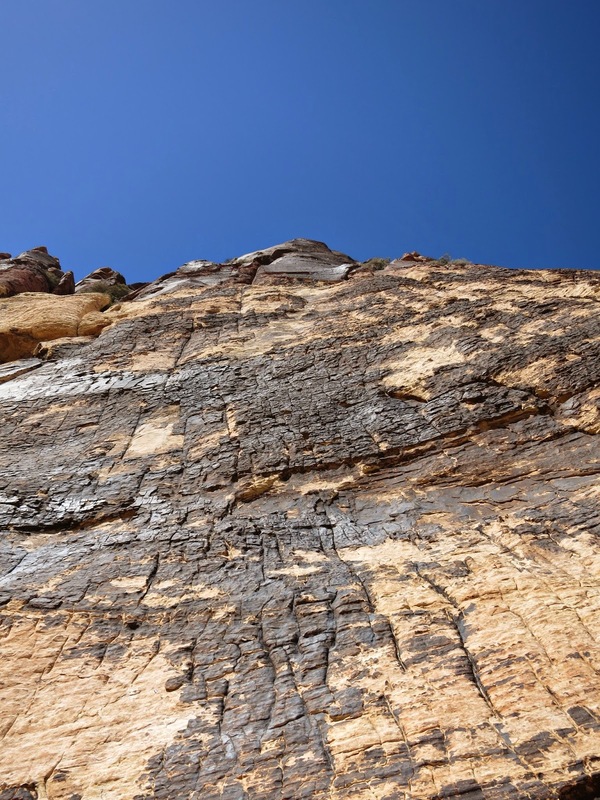 The climbing is steep, on great holds, and only gets better as you make your way through the second pitch and end up at a small belay stance below 250 feet of perfect, grid-like patina plates. The patina on the upper headwall. Climb the patina plates using some amazingly thin and fun face climbing techniques for the grade all the way to the top of the buttress. Classic! Arguably, the most difficult knot to teach is the double-fisherman's knot. It is normal for our guides to spend a significant amount of time with students on this particular knot. And even with a lot of time spent focusing on it, some still don't come away with a master's level knowledge of it. If you have this knot completely wired, then congratulations. If you don't, then this blogpost is just for you...! 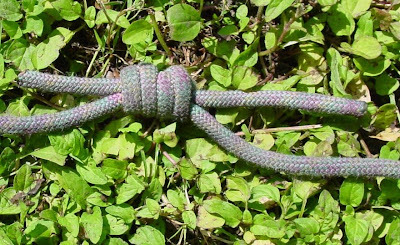 The double-fisherman's knot is a knot that may be used to join two ropes together. The ropes may be of similar or dissimilar diameters. It is a very secure knot. Indeed, it is so secure, that it is often recommended for cords that will be permanently tied together such as prussik loops. The biggest problem with the double-fisherman's is that it is very difficult to untie once it has been loaded. As a result, it is not recommended for quick situations where you want to tie two ropes together, such as in rappels. The Canadian Guide Mike Barter is a funny dude. In this video, he talks about a tying the bowline...while dressed as a cowboy. Perhaps the best line of this video is when he says that a bowline is "strong enough to pull a snowboarder off his sister." There are a couple of things that I'd like to add to this excellent video. In addition to what Mike demonstrated, we are now teaching the double-bowline in the curriculum for the AMGA Single Pitch Instructor course. This knot is quite a bit stronger than a single bowline and not as easily untied due to cyclic loading. Mike repeatedly states that he doesn't want to see people tie-in with a bowline. You may be aware that there is a trend in the sport climbing community wherein people tie in with a double-bowline. There are two big problems with this. The first is that many climbers don't use this technique to tie-in and will not be able to check their partner adequately. And second, if there is a problem in the knot, it is far more likely to fail than a figure-eight follow-through. The bowline is a very important knot. And as Mike said in the video, it could even be considered a king of the knots. But when all is said and done, it really should only be used for anchoring to boulders and trees. 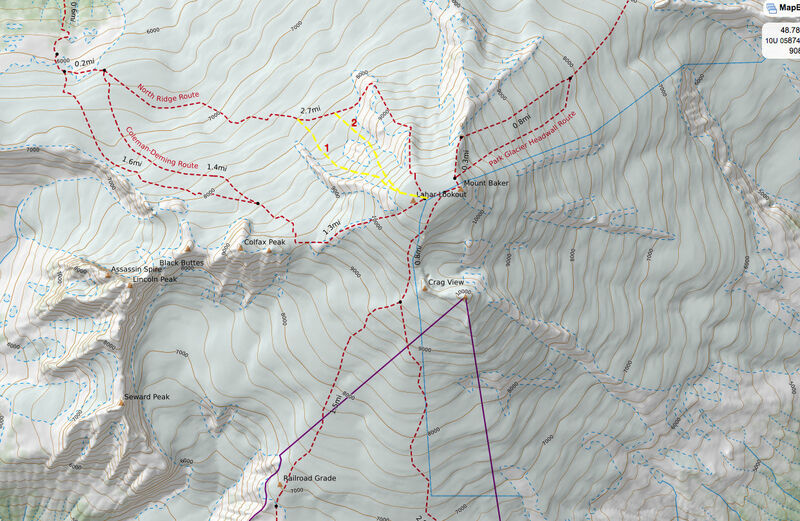 The Coleman Headwall is arguably the most complex route regularly climbed on Mt. Baker. The line is not as steep as the North Ridge and it doesn't have the fame of that route, but it is a two tool alpine climb that -- depending on conditions -- may have up to 14 pitches of climbing. 2) Left-hand line. A more dangerous (exposed to icefall) line. The Coleman Headwall is steep, but not that steep. A large portion of the route is 45-50-degrees, though there are a few steeper steps. Depending on crevasse and bergshrund problems, the route may have a few very short vertical steps and depending on how you go near the top, the terrain may kick back to 55-degrees or more. Many parties do elect to simul-climb much of the route. Some even elect to unrope and solo large portions of it. These decisions need to be made based on the conditions at a given time. The route changes a lot every year and what one experiences one year may not be the same as an experience the following year. There are two commonly climbed lines on the mountain. Both lines are shown in the picture above. The better line is the right-hand line. This is primarily because there is significantly less objective hazard. 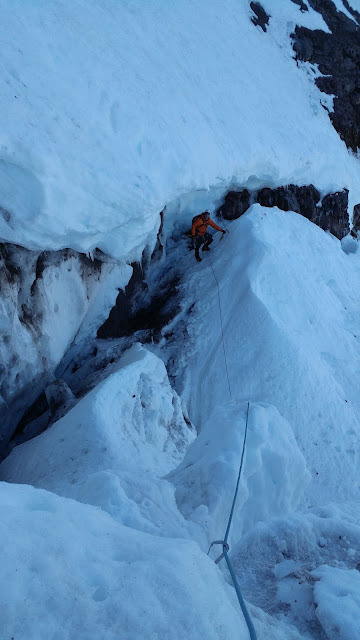 The left-hand line may also be climbed, but the first half of the route is threatened by icefall. The right-hand safer option has a number of crevasses and bergshrunds on the route. Due to melt-out this line is generally out-of-condition by mid-summer. It is not recommended beyond July 1st. The route starts at approximately 8,500-feet left of the Roman Nose and slices up into the sky, starting to kick back again to a lower angle at 10,200-feet. The summit of Mt. Baker is at 10, 781-feet. It is important to get on the route early. As the sun comes up, the upper mountain begins to shed. Small pieces of ice begin to rain down on climbers. And though the headwall isn't terribly steep, it is steep enough that a wrong move could be fatal. A marble sized piece of falling ice could have the potential to knock someone off the mountain. The American Alpine Institute guides the Coleman Headwall regularly. Indeed, it was one of the first routes regularly guided by the company. Today, there are two options for climbing the route with AAI. First, you might climb it on an Alpine Ice Course. And second, you might choose to climb it on a private program. The Coleman Headwall has become a popular extreme ski objective. Extreme, however, means extreme. If you fall on this route, you will likely die. I've been on Mountain Rescue since 2011, and in that time I've responded to two incidents on the Coleman Headwall that included skiers. In the first instance it was a fatality and in the second instance it was a serious injury. And in both instances, the skiers didn't climb the route first. This is a very complex alpine line and if you do think you have what it takes to ski it, it's imperative that you climb it prior to committing to such a descent. A foreshortened view of a line I climbed in 2017. 2 tools per person - be sure that they can be pounded into the snow to be used as anchors. Radically curved shafts for steep waterfall ice and drytooling won't work on this alpine route. 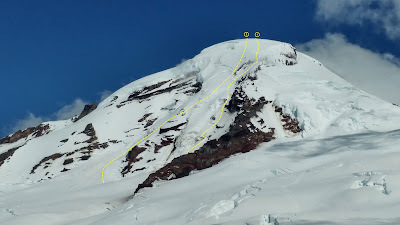 If you elect to make the climb later in the season, then you should consider more ice screws.